The value of the prototype does not consist in the rarity of the object, but in the rarity of the quality it represents. 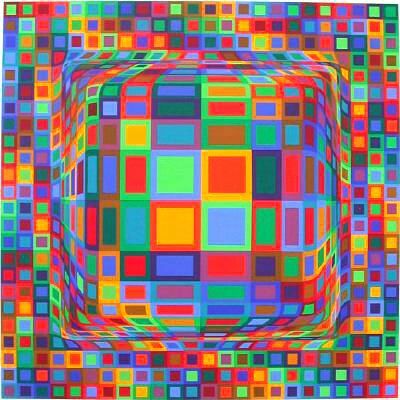 I have to confess up front that I am not a big fan of Victor Vasarely (1906-1997) or the Op-Art movement of which he is at the forefront. It’s not that I am denigrating it. I have seen a number of pieces that I do like and I can certainly see people being intrigued by its color and forms and how it can reverberate in certain environments. If I had a mid-century home with lots of glass and chrome, I might think about hanging this type of work. But I live in a cabin in the woods. It’s just not to my particular taste, that’s all. That being said, I immediately nodded in agreement when I read the quote above from Vasarely. As I read it, it jibes well with my own views on the intrinsic value of art and how the artist behind it affects the artwork’s value beyond that of a mere object. When I have spoken with students in the past I try to impress on them that while they must learn their craft, they should also focus on making themselves fully rounded humans with an individual voice that reflects their uniqueness and individuality. I urge them to read more, listen more, and to look at more things, all preferably outside their own known preferences. I believe it creates a sense of fullness that will extend into their work, giving their work a greater sense of that quality that takes a piece beyond being a mere object of decoration. And today, when there are more artists than at any other time at any point in history, its that rare sense of this quality that can make the difference in how seriously an artist’s work is viewed. I don’t know if that ever gets through to these kids or if it even holds true in reality, but it seems right to me. I personally try to view each piece as a combination of skill, experience, acquired knowledge and influences, and the flaws and strengths of my own character–hopefully, the better parts of it. 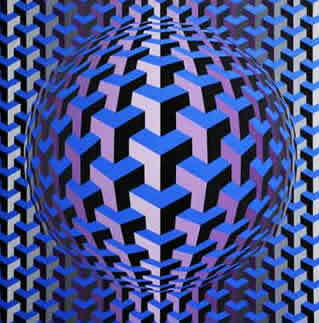 Sometimes it works and at those times I see the quality represented by it that Vasarely described. When it doesn’t, I see a mere object that lacks the fullness that I am trying to put in it. I can see that I have somehow withheld some part of myself from that work and I try to figure out how to overcome that deficiency.